Desde lugares de interés histórico a miradores, Puerto Plata tiene abundantes atracciones para mantener a los visitantes entretenidos. Vea lo mejor de la ciudad en un corto espacio de tiempo en esta excursión por la costa de Puerto Plata, que incluye 10 principales atracciones como la fortaleza de San Felipe y el histórico barrio victoriano. El límite para grupos pequeños hace que el recorrido sea más personal, mientras que la barra libre ofrece un ambiente de vacaciones. Visita las 10 principales atracciones de Puerto Plata con un guía. Victor led an excellent excursion around Puerto Plata, taking us to the mountain top, followed by an exciting cable car ride down the mountain. Historic Ft. San Felipe was a very interesting piece of history. Downtown Puerto Plata provided a shopping opportunity for those interested in doing that. I can';t sing Victor's praises enough. We had a half dozen French-speaking guests with very limited English capabilities. Victor contacted one of his friends who spoke French, picked him up, and the French guests had a very worthwhile excursion. Victor is a true ambassador for Amber Cove Adventures. My wife and I will repeat this tour in March with other friends. It was that good! I planned this excursion for my mother and myself. It was awesome. I was scared after I booked because I was not going with one from my cruise line. After I confirmed my tour and spoke with a fellow American who live in the Dominican Republic I became very relaxed. Victor our tour director was top notch. Very Knowledgeable and a lot of fun. This tour gives you a glimpse of the life in the Dominican. The cable car provides you with the most beautiful views. And to see The Redeemer was as Spectacular. The only downfall to this tour was the hike to get to the pickup spot. It’s was hard on my mother who survived and has some great memories from the tour. Amber Cove Adventures were wonderful people . For our day at Amber Cove, we prebooked this tour to see the area. It worked out fine and gave a nice view around the countryside and city sites. Otherwise Amber Cove is a cruiseline-created shopping stop that shows you nothing of the Dominican Republic. You do have to walk a distance out of the port to meet the driver and van, but it is safe and easy. Our driver/guide Victor was great. We saw real life in the D.R. as we drove up the winding road to the mountaintop. The views were great, and he stopped for photos. 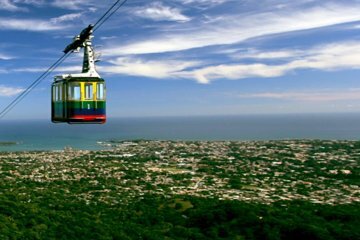 At the top you see the Christ statue and sweeping views across Puerto Plata, then a fun ride down on the nice cable car. Around the city you see some interesting sights and then a full tour of the old fort. We had a brief shopping stop in case you want to buy amber. Victor had a cooler of tasty punch and sodas or beer as you like. It was a good way to see and learn about this lush tropical area of the Caribbean. The tour guide Victor is very knowledgeable and humor. We had a great time.